With many different cultures, religions, languages and ethnicity, India has a rich and varied history. The many beautiful monuments in India which were built by our ancestors are evidence of that fact. These monuments help us understand our past. The past has a hand in shaping our present and future and it makes us who we are and what we are today. Therefore, it is undeniably important. These exquisite monuments celebrate our rich and varied history, and make us appreciate our origins. They make us understand our history. One of these beautiful monuments is the exceptional Qutub Minar. Qutub Minar is a UNESCO World Heritage Site and it was given this designation in the 17th session of UNESCO in 1993. It is located in the Mehrauli region which is in the outskirts of Delhi, the capital of India. Qutub Minar is one of the main attractions of the capital city of India which sees a lot of visits from tourists from all around the world throughout the year. Qutub Minar is a must visit place for all history lovers. Its spectacular build is sure to astound everyone who visits it. There is a controversy regarding the name of the Minar. Some say that the Minar got its name from Qutab ud din Aibak, the ruler and founder of the slave dynasty which ruled the Delhi Sultanate because he was the one who laid its foundation. Others say that its name comes from the name of the great Sufi saint Qutbuddin Bakhtiar Kaki because it was constructed to honour him. Qutub Minar’s construction was started in 1192 by Qutab ud din Aibak, the first ruler of the Delhi Sultanate. There is a controversy as to its origin. Many suggest that it was built as to commemorate the victory of Qutab ud din Aibak over the last Hindu kingdom of Delhi. Many others say that it was used to call people for faithful prayers. It was built along with Quwwat ul Islam Mosque which is a beautiful monument on its own and one of its kind. There are many other rulers and important people who contributed towards its construction, repairs and maintenance. Iltutmish, who ascended the throne of the Delhi Sultanate by succeeding Qutab ud din Aibak in 1211 is credited with continuing the construction of the Qutub Minar and added three more storeys to it, increasing its height and glory. Later, in 1369, a lightning strike destroyed the top storey of the minar. This damage was repaired by Firoz Shah Tughlaq of the Tughlaq dynasty. He not only repaired the damaged minar, but he also added another storey to it. After a while in 1505 an earthquake occurred. This earthquake damaged the Qutub Minar profusely. This damage was reconstructed by none other than Sikander Lodi, a formidable ruler of the Lodi dynasty. Much later, after the advent of the British in India, an earthquake occurred in 1803 which caused a lot of damage to the Minar’s structure. It was Major Robert Smith, a Major in the British army, who repaired these damages. He also constructed a sixth storey over the fifth storey, thus creating a new storey. This storey was later considered a folly. In 1848, Viscount Hardinge the Governor General if India took the wise decision of taking the storey constructed by Major Smith down. Today, this storey is kept to the east of the Qutub Minar for everyone to see. It is popularly known as “Smith’s Folly” as the construction of it was considered an architectural disaster, and it was nothing compared to the beautiful and masterfully constructed Qutub Minar. Without the contributions of the aforementioned people, we wouldn’t have the Qutub Minar that we have today. Historians suggest that the materials used for the construction of the minar were procured from the destruction of Hindu and Jain temples in Delhi. In fact, pillars from these temples can still be found in the Quwwat ul Islam Mosque. These pillars still contain their original Brahminic inscriptions. Using these materials, the base of the Minar, that is, the bottom three storeys are built of red stone. The top storeys are built of marble and sandstone. At 73 meters, Qutub Minar is one of the highest in the world. 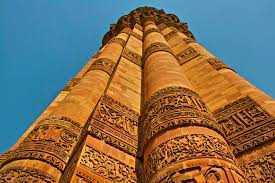 In fact, it is the tallest brick minar in the world. The Minar’s base is 15 meters in diameter and it has five different storeys, constructed by different rulers at different times as stated earlier. The three storeys that comprise the base of the whole structure are quite elaborate. Fluted shafts that are cylindrical in shape are built along with balconies. These are built of red sandstone. The forth storey, constructed by a different ruler is quite plain. It is built of marble. The fifth which is also the last storey is made using a combination of both marble and sandstone. Inside the Minar, a spiral staircase runs from the bottom to the top. This staircase has 379 steps in total. These days, entry inside the tower is strictly barred. This is because there have been cases of people committing suicide by jumping off the top of Qutub Minar. The tower is not exactly perpendicular to the ground. It tilts 65 cm from the exact vertical perpendicular. But, this is considered to be within safe limits. The fact that the Minar was constructed by different rulers at different times is evident from the evolution of its architecture. The materials used for repair and constructions differ with different rulers and different times. At the bottom, Qutub Minar is 47 feet. At the top, it is 9 feet. Thus, it is tapering. Qutub Minar also contains a lot of inscriptions in bands. These inscriptions provide details as to who built the Minar, who reconstructed it, who repaired it, what materials were used, etc. The Minar is also decorated with texts from the Quran written in beautiful calligraphy. Such beautiful engravings are difficult to find today. Such was the talent that was used in building this exquisite monument. As the rulers who constructed this monument were from Iran and around it, the tower was constructed in Iranian style. Historians suggest that the Minar has similar features as the Minaret of Jam in Afghanistan. But, this Iranian pattern of architecture is also complimented by local element of India. For example, lotus engravings and garlands decorate the Minar. Thus, Qutub Minar’s architecture can be best described as Indo-Iranian. These spectacular features of the Qutub Minar make it one of a kind in the world. There are constructions at the foot of the Minar, which are a part of the Qutub complex. There is the Quwwat ul Islam Mosque, the Iron pillar, Smith’s Folly, etc. Like Qutub Minar, the Quwwat ul Islam Mosque was also built by Qutab ud din Aibak. This mosque is unique because it was the first mosque that was built after the conquest of India by Islamic forces in Delhi. It was built together with the Qutub Minar. The Iron pillar is also a part of the Qutub complex. It was not built by Islamic rulers, but is thought to have originated in the Gupta Empire. Historians say that it was built as a dedication to the Hindu God Vishnu. It is one of the most unique structures in the world. The composition of the material used for the construction of the pillar is such that the metal does not rust, even today. This shows the high level of scientific knowledge that existed in those times and provides testimony to that fact. All this contributes towards making Qutub Minar a truly spectacular monument which attracts thousands of visitors each year. Qutub Minar reflects our cultural and historic heritage. It is a unique and important site, and the pride of our great nation.